Being in the field of branding and design separately for over 8 years and then the last 3 years together, Mike and I have experienced and seen quite a bit from our time in agencies, freelancing, in-house work, and large-scale branding projects through our business. We have worked as production designers to designed marketing materials for large brands to packaged products to designed apps to built blogs. There isn’t much we haven’t dabbled in either individually or together. Owning a studio where we focus on branding we have received a lot of inquiries of all types, but we also had many conversations with friends and colleagues who do similar work about the inquiries and questions they get. 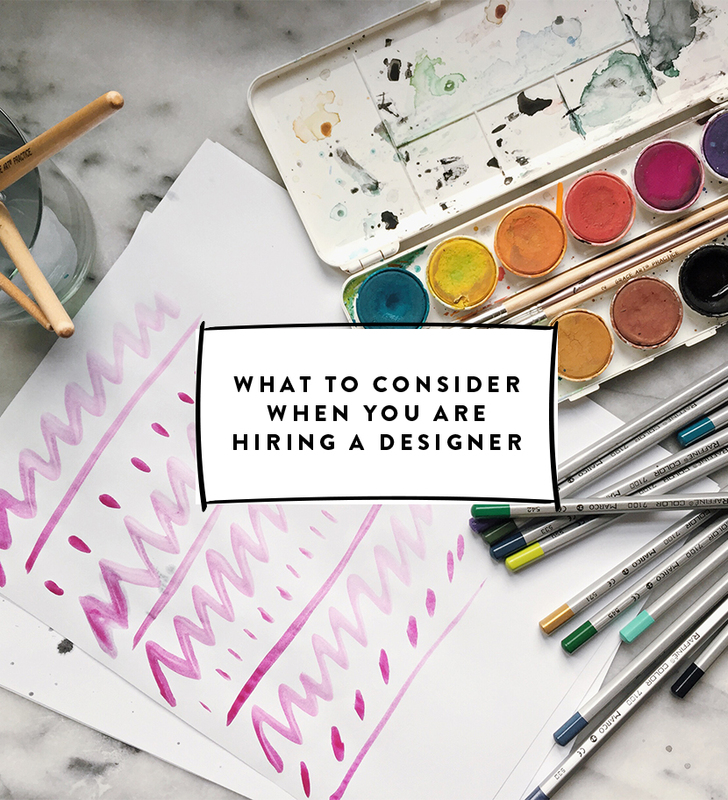 The thing we can say across the board is that the education about how, when, and what to expect of hiring a designer is a very scary world even as a designer yourself. We receive a lot of inquiries asking many questions about how to even work with a designer and we don’t blame those who ask. As I have placed myself in the shoes of those inquiring I realize how overwhelming and frightening it must be to send along an email about services. That said, we wanted to give a little list of things to know and consider when thinking about hiring a designer. We hope this will spark some great conversation as well. At the end if you have any further questions OR you want to add some thoughts as a designer yourself we would love for you to do so. Here are our 5 things we suggest considering before you hire a designer and a few things to expect. We say this in the most respectful way. Many times we and other designer friends of our’s receive emails from people beginning businesses that are looking for work to be done but don’t have much or any budget. Now this isn’t an issue as sometimes there are options for trade or investment opportunities. We personally have done this in the past especially if we wanted to try something new. But for the most part, those things aren’t common. So you must be thinking, what kind of budget should I have? Most designers cost somewhere between $30 (beginner/college student) to $200+ an hour. Bonsai has a great chart that kind of gives a range to get your brain around it all here. We are $125 an hour for logo and branding projects. All of our projects work off of that number. Every designer will price their services different. They may create a custom quote, have packages, or work on an hourly basis. It all depends on how they choose to run their business. We work in packages for logo work these days, though we used to build fully custom quotes for our clients. On average for a logo/brand buildout with 2-3 options, you can assume that it is about the equivalent of hiring a designer for a week so somewhere between 30-50 hours of work. This is just generalizing but from the knowledge of what we do and what our friends do this is pretty average. Now you may be thinking, I don’t have a budget for that. TOTALLY cool. Here’s our answer: Begin the business without a custom built logo or brand. Get yourself going. Know the cost and in the meantime talk to a close friend who knows photoshop or use a service like Creative Market to purchase something that can get you off the ground. Then hire a designer when you can really invest. The reason I say that is because we find that many businesses that even do have the cash to hire us up front end up finding out more about who they are as a business 2 years after launch. This means that sometimes they end up wanting to fully redesign their brand and website, not because they weren’t happy with the work, but because it doesn’t communicate who they are anymore or where they are headed with the business. Investing your money and time into building great product, experience, or service up front establishes your business. Typically to get off the ground all you need is a simple brand with great visual content. When you are ready to invest, shoot that designer you love an email. We promise you and the designer will enjoy the process far more. We love when a brand comes to us with an idea of what they love and want. A Pinterest board that communicates not only typefaces they may like, but also things that inspire the brand from a lifestyle perspective are really wonderful. Though it is extremely helpful to have, we see this as more of a guide when we work with someone. Designers are visual communicators. Their goal is to listen to you, hear your story, what you stand for, and the dreams you have, then they are supposed to communicate that all through something using colors and type and/or image. This means that since that is why you are hiring them, seeing your ideas as more of a guide is the best perspective for you to take. Having ideas helps to further the story, but don’t get too stuck on using only one typeface. If you are stuck on that, you may be looking for a designer that provides more of a “button pushing mentality” than a designer who’s goal is to visually communicate your brand in the most creative way possible. How long will it take to complete the work you are looking for. Having a beginning and end date are important. Though we say these dates are contingent on the responses of you as the client. Most projects delay somewhere between 1-2 weeks on average. So, expect that these dates aren’t hard dates but should be respected and if a delay is going to happen beyond that that both of you have a way to work through that. What will be delivered to you at the end. Every designer has their own process for delivery of assets. We hand over all files at the receiving of final payment. This means even the editable files, but as I said every designer is different so ask for details on what you will receive. Cost and schedule of payment. Know the exact cost of the services you are receiving before signing anything, but also know when you will need to pay. Everybody is different, but we are fairly flexible with our clients. We have done everything from all upfront to 50/50 to monthly payments. All depends on the client, but making sure everyone is clear up front makes for an easier process of working together. We will be the first to tell you that an all new logo isn’t going to fix your sales for the new year. A brand is an all encompassing thing these days. To boost sales a new logo with a great rollout can be powerful, but there is more to it than just having a hip logo. We tell our clients that it is our job to make someone want to pick up their product but it is their job for the person to come back and buy it again. Do not place all your bets on the logo you just invested in. It will be instrumental in growth, there is no doubt, but it will not be the savior. We offer consulting to many brands who want to figure out how to make the most out of their brand launch, want to boost their exposure, or are wanting to know how to utilize various tools to make a bigger impact on their market. This is something we do quite a bit because we know how important it is to not only look good on the shelf, but walk the talk from top to bottom. Taking the expectation off of the brand being the all or nothing will help your designer work better for you and allow you to find more joy in the results you get from them. The most important thing for a designer to create great work is to be inspired and connected to their client. You may have an experience where a designer passes on your project. This isn’t because they don’t believe in what you are doing, but they may just not be connecting to it, feel it is a good time for them, or the list goes on. A great designer will know when to accept and when to let a project go because it won’t be a good fit. On the other side, that can feel like rejection instead of respect. Don’t feel put out because a designer decides your project isn’t for them. Ask them for some referrals and move on to the next designer down the list. In the same way if at any point you don’t feel the designer fits you you can move on as long as you are not violating any contractual obligations. The earlier you move on the better. The biggest thing to remember when heading out to find a designer is that this is someone’s job and livelihood. Great creative work from a great designer takes time and a lot of effort so be patient and make sure you feel connected and happy who you choose to work with. Like I said, designers, leave your thoughts and suggestions below and if you have any questions leave them as well! We would love to hear some discussion on this topic. This was such an informative post, Megan! I’m just beginning to work with designers for logoS, and eventually a new site. Your tips gave me a lot to think about in terms of the process and what to think about when moving forward. Thank you so much for this advice! As a designer, I’m thankful you guys made this post. I find that many clients HESITATE to begin new projects BECAUSE of many of the questions you answered here. So glad you appreciate it! There are so many unknowns for both the designer and the client. It is hard to know what is right and what isn’t and what to expect along the way. IN THIS ARTICLE, I FOUND very USEFUL INFORMATION. I WORK WITH DESIGNERS EVERY DAY AND YOUR ADVICE is PERFECT FOR ME. IN MY OPINION, THE MOST IMPORTANT THINGS is TO KNOW EXACTLY WHAT YOU WANT AND WHAT IS TECHNICALLY POSSIBLE TO be done by THE DESIGNER FOR YOU. I’m not a designer, I’m a sales account manager and from my experience, one of the main problems when someone want to create their own website is that they expect the designer what to do or how the customer has to focus their business and this is something a lot of designer refuse to do for a myriad of reasons. Maybe people who start has to differentiate between a web designer and an strategic consultant. No all designer have both skills and people most of the time expect both for the price of one. Excellent post that I’ll definitely be passing on, because you’re right – this can be a very scary endeavor! These are some great points, especially about making sure you’ve laid down the expectations thoroughly. After all, if you’re going to hire a designer, you want to make sure that you both understand how much you’ll be expected to work. It is something that you want to get done as soon as possible so that there is no confusion later on in the partnership.